Many Americans think of wars through the major battles and events taking place on the front lines. Bill Torsiello’s goal was to show Mt. Laurel residents there’s another side many people never hear about. 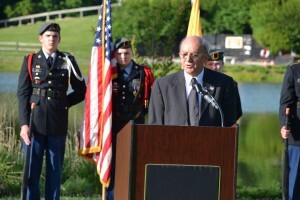 Torsiello, an Army veteran who fought in the Vietnam War from 1965 to 1967, was a guest speaker at Mt. Laurel’s Memorial Day Tribute on Friday, May 30. While Torsiello engaged in a number of battles during his time of service and was wounded, combat is not what sticks out to him about the war. Instead, it was the service he provided to the people of Vietnam. Torsiello said his greatest accomplishment during his service was saving 110 Vietnamese orphans who were suffering from deplorable conditions. The troops managed to save the children from starvation after a number of nuns came to them asking for help. “We were helping getting them out of there, but we didn’t know the conditions they were living in were so horrendous,” Torsiello said. The troops helped to take care of the orphans and raised money to help build the Mang Lang orphanage, which still stands today. Throughout the war, the soldiers acted as protectors for the orphans. The troops would visit Mang Lang, playing and enjoying the company of the children. Being able to make such an impact was important to Torsiello. The worst part, however, was leaving. “For years, I was haunted by the screams of screaming children, because they didn’t want us to leave,” he said. Torsiello told the story of the orphanage to show those in attendance how war is more than just fighting. There are stories of humility and compassion. The Mang Lang orphanage bonded a group of American soldiers with children born thousands of miles away. These are types of stories Torsiello believes should be told more often. He said United States military personnel perform many duties outside combat. “The American soldier stepped up to the plate repeatedly under the most adverse conditions,” he said. Though it has been almost 50 years since Torsiello served in Vietnam, he still feels a connection to Mang Lang and the orphans who resided there. Last fall, he flew back to Vietnam to reunite with one of the nuns who helped run the orphanage as well as four of the orphans, now in their 50s. His return trip to Vietnam will be featured in an upcoming documentary about Mang Lang. Torsiello left the Mt. Laurel community with the importance of remembering soldiers who died in the line of duty. During Vietnam, he said there was stigma against veterans. Even though treatment of veterans has improved since, he still encouraged residents to get more actively involved. Deputy Mayor Irwin Edelson echoed Torsiello’s statements. Residents were asked to plant flags at veterans’ gravesites to memorialize them during future Memorial Days. “We need people to volunteer and help out,” Edelson said.